Anyone who has seen Dragon’s Den appreciates what a great idea for a startup looks like. Contestants turn up with a unique idea. They’ve taken out a patent. They have something people want; all they need is investor’s money. Here is a classic example, GripIt. We love stories like that. A boy, bullied at school, has a great idea and becomes a millionaire. But true Eureka moments are rare. Ideas that strike out of the blue whilst you are having a shower are as rare as winning the lottery jackpot. Patentable ideas for a startup are not only rare they are also fraught with problems. If you are serious about starting a self-sustaining business you do not want to start with a unique patentable idea. I will tell you why and also offer you better alternatives. Whilst I just called them “patentable ideas”, this is a misnomer, ideas are not themselves patentable. You must first take your idea and translate it into a product which can be described, explained and defined. When you apply for a patent, the patent office will evaluate the product and decide if it satisfies their criteria. Unless you have worked in a setting in which patents are common, you are unlikely to understand the patent process by yourself. Patent law is enormously complicated. Unlike many other business activities which you can learn and improve as you go along, you cannot navigate a patentable invention without the help of a patent attorney. Unfortunately, this expert advice comes at a huge cost. Patent costs are enormous. Let me put a figure on this. A patent attorney charges around £350-400 per hour plus VAT. This means a single innovation will cost you £50-100,000 to get patent protection in the most important countries. Worldwide patents don’t exist. You must apply for them in each country you seek protection. The lion share of the costs come from patent attorneys fees and costs for translations. With such a high cost attached to patents, it is easy to convince yourself that they are the most important part of your business. In reality, whilst patents can be a valuable asset, they are only one piece of the startup puzzle. Patent applications are a gamble. First, you need a patent search. This alone will cost hundreds of pounds and there is no guarantee that the search outcome will be in your favour. Sadly you won’t get the money back if the search shows that you are not the first to have the idea. Even if the search is optimistic and your patent attorney thinks you have a good chance of the patent being granted, expensive problems can later arise. The patent office might find undiscovered patents and decide your idea is obvious and therefore not patentable. You can object but every interaction with your patent attorney and patent office costs more money. You could end up spending lots of money and have no tangible benefits in return. Nothing you would be able to reuse for your next project. Ideas which have the potential to lead to a patent must be kept a secret before filing; you can patent inventions only if they are novel. In legal terms, they must not be disclosed. This leads many inventors to adopt a mindset of keeping things under wrap. Even though inventors can disclose their idea after filing, they often worry that so much is at stake, that they don’t want to tell the world. Many inventors worry that someone might steal their idea. The problem with a secrecy mindset is that it is completely opposed to the mindset you should adopt as a startup. The greatest challenge you face as a startup is for your customers to get to know you. So whilst it may take 2-4 years for your patent application to proceed, you cannot afford to keep it hidden. A further problem with patents is that they make ideas concrete at an early stage. A patent has to describe and define the product in great detail before the patent office allows a patent grant. You may find after filing that a small change would have made your invention significantly better. But 18 months after filing your patent will be made public and from then on it will be fixed. You cannot amend it to include any improvements. For a startup it is better to seek small improvements often. The biggest advantage that a startup possesses over larger competitors is its agility. With patents, you may compromise the biggest advantages you possess as a startup. Patents are costly, so you may consider handing over the risk to someone who accepts risk in return for part of a business. Many businesses seek investment from VCs or angels. But this can create its own problems. In 2011 I started my first startup Cosyplay, which makes baby play mats. In my first year, I met many CEOs of other baby product companies, who passed on their experiences and gave me helpful advice. The baby industry is full of capable entrepreneurs that had successful careers before entering the baby products industry. Some CEOs were talking about feeling trapped by their loans and investments. So much was at stake, sometimes their family homes, that the CEOs could not leave their baby product company. They were yearning for their earlier life with a guaranteed salary and holidays. They missed their old jobs and they could not return to them. Neither could they move on to a better idea. It seems once you accept external funding you are no longer in charge of your ship, you have to sail where the VC money blows. These CEOs wanted to be masters of their own companies, but became slaves to their investors, by accepting money to pay for their patents and other startup expenses. It is arguable whether patents are the best tool to bring a baby product to market. The case for patents is much clearer if you are dealing with high-tech inventions. Developing technical or scientific inventions is extremely costly. You cannot risk developing such a technology without a good chance of being able to recover the money. Patents afford this opportunity. However, high-tech inventions, even though they have the potential to generate real fortunes, are fraught with even greater risk. The more lucrative your invention is, the more it is under threat from the competition. They will put every effort into finding a fault with your patent. Or they will invent a similar solution to your product that solves the same problem but is outside the scope of your patent. You may think the answer is to invent something so dramatically different that nobody has ever thought about it. This would guarantee you a very wide patent scope. The problem is that your customers will not expect the solution. They may not even experience the problem such a solution solves. Dramatically new inventions are often called disruptive technologies. A disruptive technology is an invention that creates a new market and disrupts existing ones. It requires customers to transform their behaviour to benefit from the technology. An example of a disruptive technology is the mobile phone. The mobile phone was invented by a researcher at Motorola in 1973. It took 20 years for the technology to mature and for it to become useful for people to buy. In the meantime, Motorola had to educate consumers in the benefit of this new device. This is typical of disruptive technologies; they don’t enter the market with a bang; they are slow burners that eventually get adopted once the market is ready for them. Frequently it is not the inventing company that benefits most, but their competitors, who arrive at a much later stage. Apple didn’t enter the mobile phone market until 2007, but quickly grew to become the major player. As a first-time startup avoid any business ideas that need patents as a necessity. Don’t start with a disruptive idea, start with a simple one which is easy to grasp by your customers. Apart from competitors overcoming your patents, there is another risk that every patent owner faces: infringement. Infringement occurs when another company produces products which are covered by your patent. The infringing company is breaking the law, but nobody will stop them unless you do. Stopping infringers costs large sums of money because only a judge can decide if infringement has occurred. On top of this, some countries don’t adhere to patent law or claim to be unable to enforce it. This is a big problem especially for startups. Some Chinese manufacturers recently copied Kickstarter projects even before the inventors could raise money for a prototype. Patent applications for these inventions were in place, but the inventors found it hard to deter the infringers. This creates a massive burden for the startup, both mentally and financially. As a startup you have limited resources. Your time and money is better spent connecting with your customers and building your brand so that customers choose you over cheaper rip-offs. If you want to know the best place to start your business, start with your customer, not with your idea. People that succeed in business are not individuals with the best idea. They are people that had AN idea and did everything required to become a self-sustaining business. They learnt the skills, they made mistakes. And they eventually found the right way to serve their customers better. Often the best ideas are not actually new. Richard Branson launched Virgin Atlantic despite many other airlines covering the same routes. The difference was that he put customer experience, comfort and enjoyment first. If you want to start a successful business, you don’t need a patent. Accept that somebody else may copy you. Instead of concentrating on patents, work on relationships with your customers, build trust, and get traction in the market. 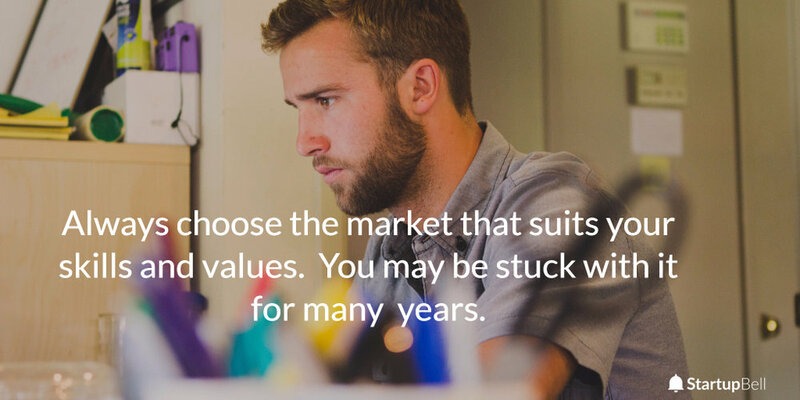 Always choose the right market that suits you and your skills. You may be stuck with your first business for 10 years. For example, if your great idea is a novel potty, ask yourself, do you still want to talk about babies’ poo when your own children are at secondary school? You may not. Make sure you don’t have huge amounts of money invested in your idea if it is not something that will interest you for the next 10 years. I believe the reason many baby product entrepreneurs appeared unhappy is because of the poor overlap between their skills and what their market required. My own experience confirms this. I am a scientist by education, which means I was trained to think in a certain way. Scientists look for evidence. But the baby product consumer does not care about my education or evidence-based facts. My customers are parents and they want to feel good about a baby product they purchase. I had to learn that you cannot convince a new parent with facts. My scientific awareness is more of a hindrance than a strength in the baby product market. In contrast, Bambino Mio, the reusable nappy manufacturer, is a great example of a company that aligned itself perfectly with its customers from the start. Guy Schanschief, the CEO of Bambino Mio originally started a nappy laundry service. His first business was not as successful as he hoped. But his desire to rid the world of disposable nappies soon led him to start Bambino Mio, which produces reusable nappies. Guy was genuinely enthusiastic about his mission. True purpose always shines through and in 2011 Guy Schanschief was awarded an MBE for his services to business. It seems not everyone gets tired talking about baby poo. If you start your first business, make sure your company’s purpose matches your personal values. When things get tough, you will still find the energy to carry on because it truly matters to you. You don't want to be bound by an expensive patent. If you have identified customers you want to serve, that’s great, but you still need a product idea. No customer chooses a product because it is different. In your customer's mind, it has to be better. So, where could you uncover an idea suitable for a startup? The answer could be “unpatentable ideas”. If someone, anywhere in the world, created an invention and started to execute on it without a patent, the invention is no longer new and therefore unpatentable. Also, patents that have expired or lapsed cannot be patented again. There may be many reasons why someone dropped an invention before it came to fruition. The inventor may have run out of money. Or passion. Maybe the idea was flawed. Maybe the market was not ready. If you consider this type of idea as your first business, you need to discover as much as possible about the idea and why it was dropped. In my experience inventors are often happy to help others that are interested in what they tried to build before. Make direct contact with the inventor if possible and arm yourself with knowledge that will put you ahead of the competition. Here is an example of the kind of idea I mean. Windscreen wipers were first patented in 1903 by Mary Anderson, who tried to sell the patent in 1905. Her invention was rejected by car makers at the time because they could not see the value in windscreen wipers. Her patent expired in 1920, several decades before the car industry became established through mass-production. To this day, cars use windscreen wipers based on Mary Anderson’s original invention, but she never gained financially from her invention. As a startup, don't be like Mary Anderson, instead look out for inventions like hers in 1920. Full of potential, but without patentability. Intellectual property protection is important for startups. But patents are not the only way to protect your idea. Copyrights, trademarks and design rights are other important forms of intellectual property you should consider. If your idea is a physical product, you may consider design rights as a cheaper alternative to patents. Design rights only protect the shape and look of a product, not the function. So they have their limitations. The biggest downside of a design right is that it is much easier to overcome and offers relatively little protection in comparison to a patent. But design rights also offer significant advantages over patents especially for startups. Firstly, they are much easier to understand and cheaper to secure. But more importantly, you can apply for a design right up to 12 months after you first start marketing the product. This means you only need to protect your design if you know you have a market and paying customers for it. And you will be in a better position to pay for your design right if you have an income from your business. If your business does succeed patents can, of course, be of enormous value. But whilst you find your business feet, I suggest you look for simple ideas and leave the patenting for later. No great inventor ever just had one big idea. You can consider patents later. Once you are in the market, you will spot opportunities to improve. Some ideas may be suitable for protecting with patents, whilst others may not be worth a patent. First, you will need to understand what your customers need, what already exists and which part your competitors dominate. You will then be in a better position to judge which intellectual property most suits your idea. A great example of a company, which started with a design right and built a successful business from scratch, is Magmatic. Magmatic is the company behind the Trunki suitcase. It shot to fame in 2006 when during a Dragon’s Den show Theo Paphitis broke the strap of a Trunki. This embarrassment did not however, stop the company from becoming a great success. Magmatic sold over 1 million Trunki suitcases in the 6 years after Dragon’s Den. It also continued to invent. Magmatic now holds several patents, covering toy storage, car seats, backpacks and fastening systems. To the novice, patents seem a good idea. And the media reinforce this view because it makes a good story. But amazing rag-to-riches tales like GripIt are just that, they are stories. The fact behind the GripIt story is that the invention was not just made by the 13-year-old Jordan Daykin, but also his 73-year-old engineer granddad. It’s safe to assume that as an engineer he would have had some experience with patents. Also, the GripIt was not the first company that young Jordan Daykin founded, it was his 3rd. It is likely that he had gained valuable business skills in his earlier companies which allowed GripIt to become the overnight success that the media want us to see. As a first-time entrepreneur, be careful which stories you believe. There are many ways to succeed. Starting with a patentable invention is costly and risky. Other alternatives offer better opportunities to learn the business skills which will lead either to a successful business or which you can take with you to your next venture. This website and its content is copyright of StartupBell. StartupBell is a registered trademark. © StartupBell 2018. All rights reserved.